The paper was published in Nucleic Acids Research. For a summary see Dr. Zehua Chen's web page. For the previous paper in this series read about T7-like promoters! 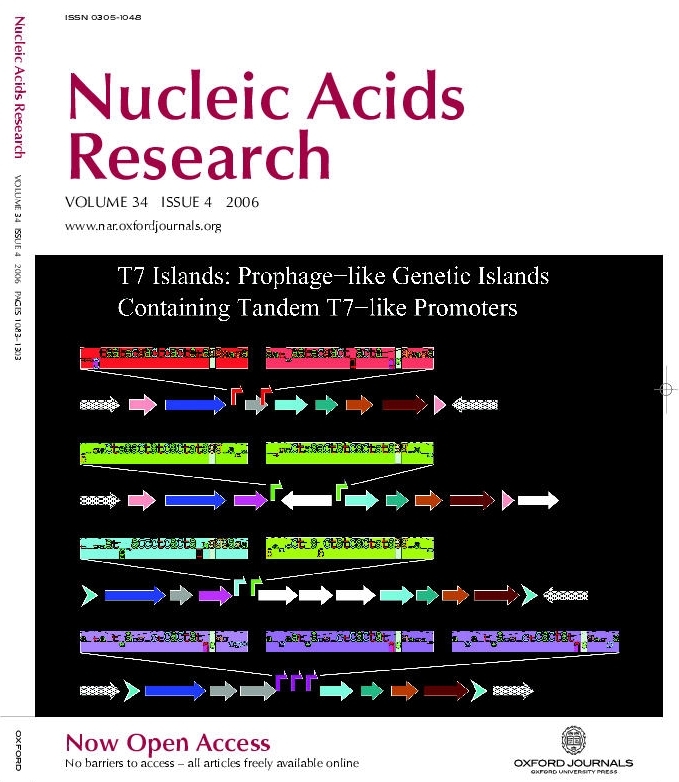 Twelve prophage-like T7 islands have been discovered in pathogenic bacterial genomes. These islands contain two or three tandem T7-like promoters that should be activated when a bacterial cell is infected by bacteriophage T7 or a related phage. The illustration shows genetic maps for four of the islands, Ty2, BS512, E22 and ECA, which are found in the genomes of S. enterica Ty2, S. boydii BS512, E. coli E22 and E. carotovora SCRI1043 respectively. The T7-like promoters are represented by different colored bent arrows (red, T7; green, K1F; cyan, T3; magenta, unknown T7-like) and by corresponding sequence walkers. As in previously known mobile genetic elements, two of the islands, Ty2 and BS512, are adjacent to a tRNA-Gly gene (pink arrows) and have direct repeats of the 3' end of the tRNA gene (pink arrow tips). The other two islands, E22 and ECA, have different direct repeats on their ends (cyan chevron arrows). Each island encodes an integrase (blue arrows), several putative phage-related proteins (other arrows) and often several insertion sequence elements (white arrows). They put a T7 polymerase expressing plasmid into a strain with an island and expression killed the cell. Deletions were in the island! These results demonstrate that the promoters we found are real and kill the cell when activated!